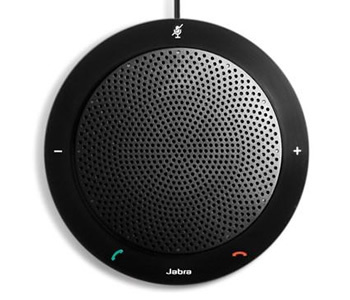 Jabra's uniquely slim and ultra-compact design makes on demand conferencing not only possible but cost effective. Connect via Bluetooth® or USB to your PC, tablet or smartphone anywhere, anytime. Jabra takes audio conferencing to a new level with Jabra SPEAK™ 510, a unique portable speakerphone enhanced with Bluetooth® You can literally turn any room into a conference room to stay focused wherever you are and increase your productivity. Plug-and-play connectivity to PCs and any Bluetooth®-enabled device for enhanced mobility and freedom.